There's a saying, popularized by a last century Chicago song, that goes, "You don't know what you got until it's gone and I found out just a little too late." That's the song I've been singing every morning in the shower as Child #2 wanders in and out of my open plan bathroom. I really underestimated the importance of a door! Our new house is the antidote to our old one. Where, it was old and respectable, this one is newer and modern. Lots of levels, lots of stairs, lots of fun. From outside it kinda looks like a ship. I love everything about it, except the fact that there is no door to my bathroom. When I say no door, I don't mean a doorframe space where a door has been removed. I mean a great big open space where bedroom melds into bathroom when you walk around the corner. Have I mentioned my son likes to talk? Saying he likes to talk is an understatement, sort of like saying fish enjoy water. My early morning shower time has become his captive audience time. This morning's pre-coffee conversations went like this. "So, I breeded a Nose Breather and a Funky Monkey and if you had to guess would you say I got Smelly Feet or a T-rexasaurus?" "It's bred and could you please give me some privacy." "I am giving you privacy! My back is to you." "I need you to leave the room!" "How do you define the room?" "Where the floors change color. Leave! Now!!" "How about if I stand at the edge of where the floors change colors so you can still hear me?" 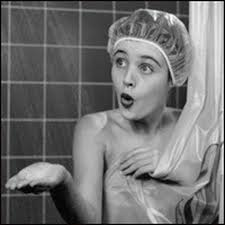 The indignity of my less-than-private shower is compounded by the cheerful chatter that awaits me the minute I step out of the shower. "Do you think gummy worms contain any vitamins? If you had to pick a number that looks the most like you, what would it be? No really, Mom, you're just saying a number and not thinking about one that looks like you." This morning, in a weak moment, I sent him back upstairs to see what his sister was doing. Two minutes later I, along with everyone else in the neighborhood, heard her shriek, "GET OUT OF MY ROOM!" Followed by the loud bang of a door. I know I should feel bad about playing one child against the other, and I really would if only I wasn't so jealous of their doors! Labels: Doors are so underrated. At least my closet has a door. And I'm not above locking it. Sadly the door to the bedroom doesn't lock. Weird but true. Doors. Family. Life. Writing. Couldn't handle that. I'd lock my bedroom door. We had doors to every room in the house when I was little but it never really stopped me from following my mom around. My brother was never a problem because he would have always rather been in his room reading than talking to anyone. I am sure I drove my mother crazy. Oh my gosh this is my master suite too. My husband can't stand it and I have to constantly tell the kids to get out and give me privacy. Haha. Ah, the endless questions and a stream of questions in the early morning is another thing that doesn't go well with me, lol! I need time to pull myself together and put on my face the day persona. Privacy is not something I can give up even for a beloved child. I'd also lock the bedroom door or, if there isn't a lock, let them know that when the bedroom door is closed it means no admittance (that's one rule that stands firm in our house for various reasons). I need doors too, a moment of privacy when kids are about is a moment of serenity. But, come to think of it, I may have followed my mom around too and talked through doors. I may have been one of those kids. . .oh well. 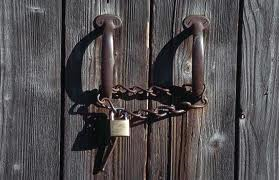 When i was a kid and mad at my parents I used to swear at their door once it was shut. Good job they had one! Our song here would be "The Sound of Silence"
The prizes for losing were enormous. A whole week of dishes, for instance, instead of trading off. Around the ages of nine and eleven they put their heads together and said "We don't care!" But it was good while it lasted. That would drive me bonkers. Bad enough my cat chatters at me while I'm in the shower. "But I want you (wah)"
Doors don't help Johanna, they just muffle the sound. Ah, the priceless chatter of kids. I have a talker too, but I'm not sure how I'd cope without a door!! Sometimes a silent shower is perfect. I love when little kids are so inquisitive. My son was like that too. I found that out talking them sometimes works for about 20 minutes. I couldn't live without the bathroom door though. No door? I don't care if I had to build one myself, and construct an entire wall out of plaster - I would MAKE a door. Bathroom privacy is sacred. Oh man I feel your pain. Our master bedroom melds into the bathroom, except for the toilet. But I hate it. And hey! I took your advice and have started watching House of Cards. AWESOME!!!!!!!!! !